On Jan. 21st, National Squirrel Day, we'll kick off our fundraiser to buy 1 white oak tree to provide shelter from the cold and acorns for food. We also aim to increase park stewardship to keep the park clean. "I really love animals and the environment and I want to plants seeds of compassion, especially with younger generations. 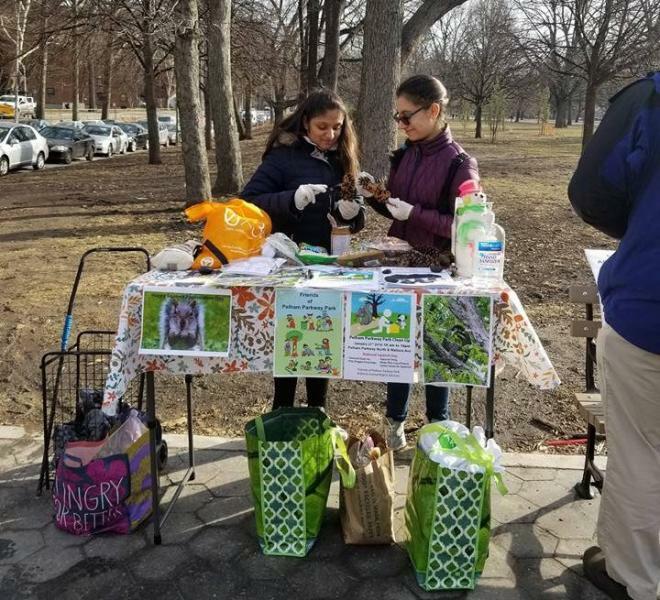 Maybe they'll grow up to be like me and help to take care of the park and the animals that call it home," says Roxanne Delgado, a longtime Bronx resident who started Friends of Pelham Parkway last year with other neighborhood park stewards. 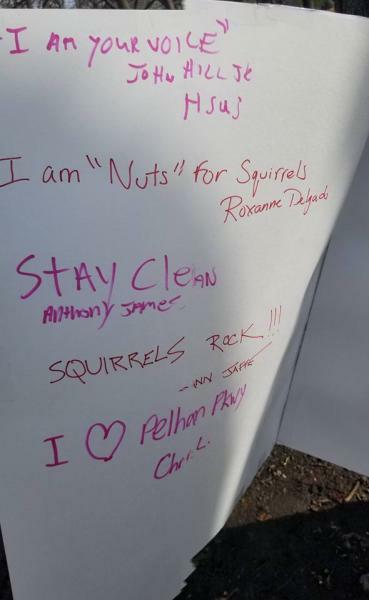 It all started when Roxanne Delgado saw a squirrel rummaging through a pile of trash and said enough is enough! We've done monthly cleanups on the North side of the Parkway since July, 2017. In our first cleanup, we collected over 9 bags of trash including inner tube tires, window frames and bathroom sinks! 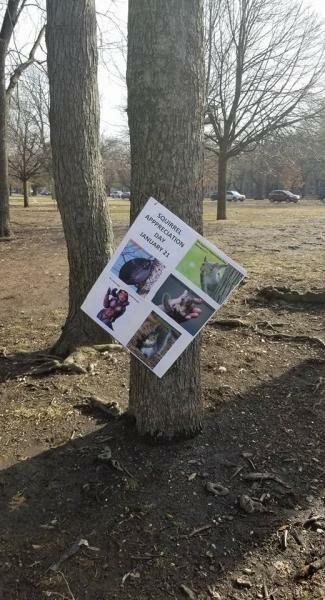 At our monthly cleanups, we also do tabling on educating the users of the parkway, to be more environmentally conscious and not dump on our Parkway. We also give out free doggie poop bags so Pet Parents pick up after their pooches. WE'VE STILL GOT A LOT TO DO AND YOU CAN HELP! 1. Donate to this project. Every dollar counts and will help us purchase a white oak tree*, providing shelter and food for park squirrels. In celebration of National Squirrel Day on January 21st, we would like to raise fund to buy and plant this tree in our Parkway. So far this winter, we have already had a deep freeze in NYC and our furry friends need some extra help! Squirrels live in nests built with just sticks and leaves and do a great job building their nest with no tools. However, with the extreme cold and wind lately, I think we can help out with the planting of this additional tree. 2. Volunteer! We can use your help at tabling events and at ongoing cleanup efforts. 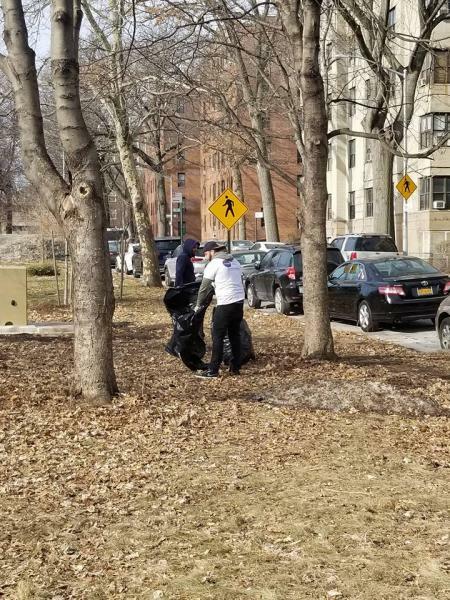 Our park is over 2.25 miles long - it's our Bronx mini Central Park - and we need help to prune the weeds and clean up trash that's left in our park. 3. Your donation will be matched. Our project has been approved by Partnerships for Parks to receive up to $1,000 in matching funds! Watch your donation double! * Please note that we've had to adjust our original goal of purchasing rubber squirrel homes to a goal of purchasing and planting 1 white oak tree. Jan. 21st: We will be at the parkway to celebrate National Squirrel Day with trivia and other information at our table. Come out to say hi and to learn about squirrels and our park! Feb 15th: Promote the event via social media, fliers placed on the corners of the Parkway and meeting with nearby schools to join the March event. These squirrel homes, 2 new white oak trees, will not just be great for our furry friends but also for the Parkway. 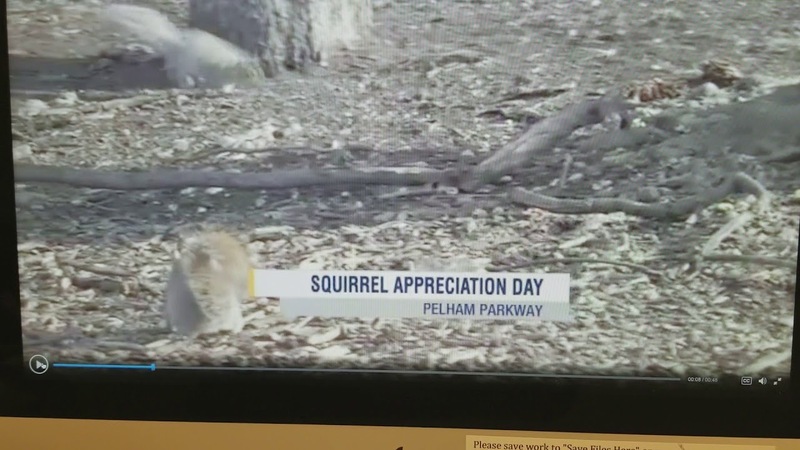 We think it will deter littering and dumping unto the parkway if people were more conscious that the parkway is a home for living creatures like our squirrels. When we did our first cleanup in July 2017, we collected over 9 full bags of heavy trash dumped unto our Parkway. Since then we have been doing cleanup and tabling to deter the dumping of trash unto our Parkway. 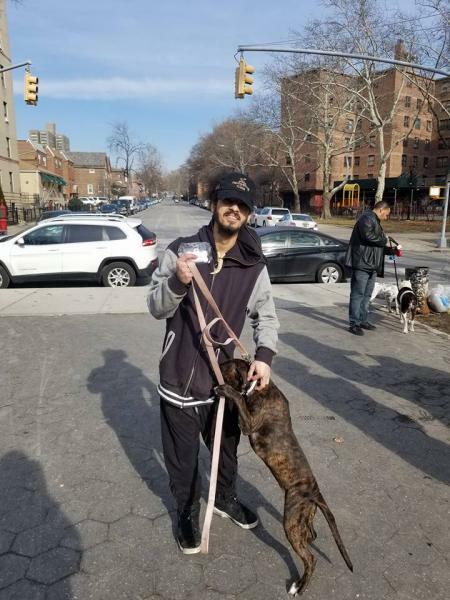 We even give out free poop bags so people pick up after their dogs. We have seen positive results from our tabling and we still have work to do. Our mission is for the residents and users of the Parkway to appreciate the beauty of our Parkway and respect Nature's beauty. Our monthly cleanups and tabling have been a positive step forward. However, we have lots of work to be done. If people were consciously aware that the parkway is not only our sanctuary from the urban concrete but a home for other wildlife then we can make progress together to care for our park and everyone and every creature who uses it. Funds raised will go towards the items below. We've had to adjust our project in order to comply with safety instructions. We have been informed that because of liability and safety concerns, the Forestry Department will not allow us to install squirrel homes. To keep the intention of our project, we have determined that we will instead plant 1 white oak tree for the squirrels. Thank you for your continued support (see our updated budget below). We are so grateful for the overwhelming support of our first donors! Your donations pushed us past our goal so easily and quickly and we think that's a positive sign that there may be even more support for our squirrels and Parkway out there. There is always more to do to care for our park so we've decided to increase our goal and ask for help with a few additional items that we need as a volunteer group (see below). We do need a utility wagon to carry supplies. Sometimes we don't have enough volunteers to carry all our gear to the parkway. Also a nice flower garden would be great for our park! Thank you! Every donation counts and we appreciate all of your support! Each squirrel home comes with straw, shipping and installation materials included - so we'll have all that we need to install each home! Our story on ioby's national blog! Sadly, this two-mile-long zen oasis has developed an ugly problem: untamed garbage. As a CBS New York story reported in December 2017: “Instead of taking their trash to the curb, people are taking it to a public park in the Bronx, and residents are outraged.” Roxanne says she was seeing everything from bags of clothes and kitchen scraps to bathroom sinks and window frames strewn around the lawns. The situation reached a breaking point for her last spring, when she saw a squirrel—one of her favorite features of the park—rummaging through a pile of trash. She decided enough was enough, and founded Friends of Pelham Parkway to promote stewardship of this prized green space that serves residents of several adjacent neighborhoods. 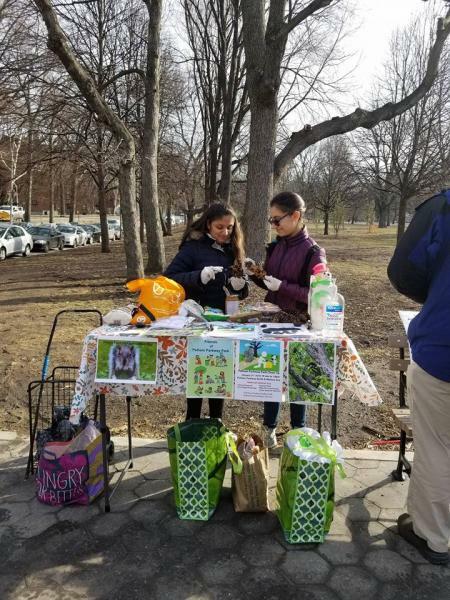 After a series of successful monthly cleanup days and tabling sessions, Roxanne is now taking the next step and raising money on ioby to buy and plant a white oak tree in the Parkway, create signage to encourage stewardship, and purchase more outreach materials for the Friends. We have a match challenge! We are so thrilled to announce that we've been accepted into a match challenge with Partnerships for Parks! Our project has up to $1,000 to win through this match challenge. Because of your generous donations to date, we've already secured $619 of the match! Thank you! We can't do this without you. We still have $381 to win. Every donation you make moving forward will be doubled right before your eyes! We are competing with other teams and your generous and timely gift is very appreciated! We've had to adjust our project in order to comply with safety instructions. We have been informed that because of liability and safety concerns, the Forestry Department will not allow us to install the squirrel homes. To keep the intention of our project, we have determined that we will instead plant 1 white oak tree for the squirrels. This will provide additional shelter AND produce acorns for additional food supply. Thank you for your continued support (see our updated budget below). We are so grateful for the overwhelming support of our first donors! Your donations pushed us past our goal so easily and quickly and we think that's a positive sign that there may be even more support for our squirrels and Parkway out there. There is always more to do to care for our park so we've decided to increase our goal and ask for help with a few additional items that we need as a volunteer group (see below). We do need a utility wagon to carry supplies. Sometimes we don't have enough volunteers to carry all our gear to the parkway. Also a nice flower garden would be great for our park this spring! 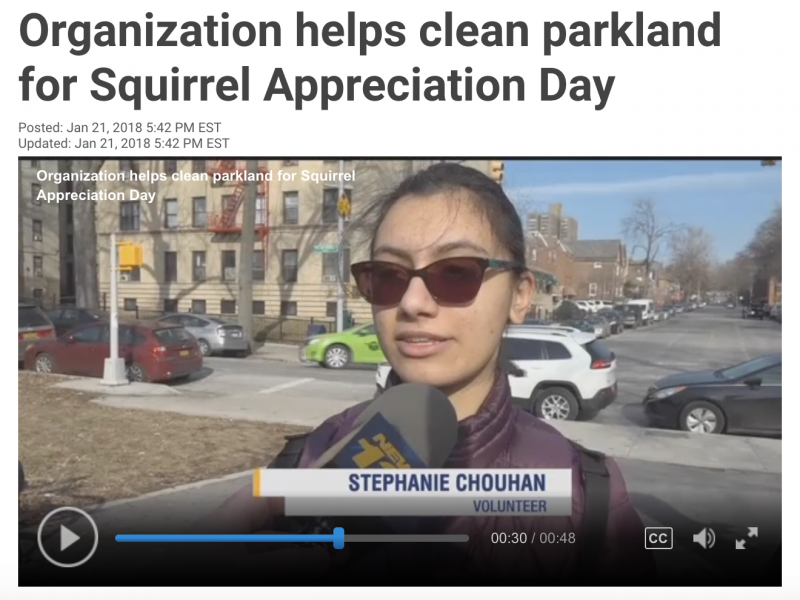 Bronx News 12 featured our park clean up and squirrel appreciation day on Sunday, Jan. 21st. Click here to watch our volunteers and community in action. Check out our photos from our clean up day! 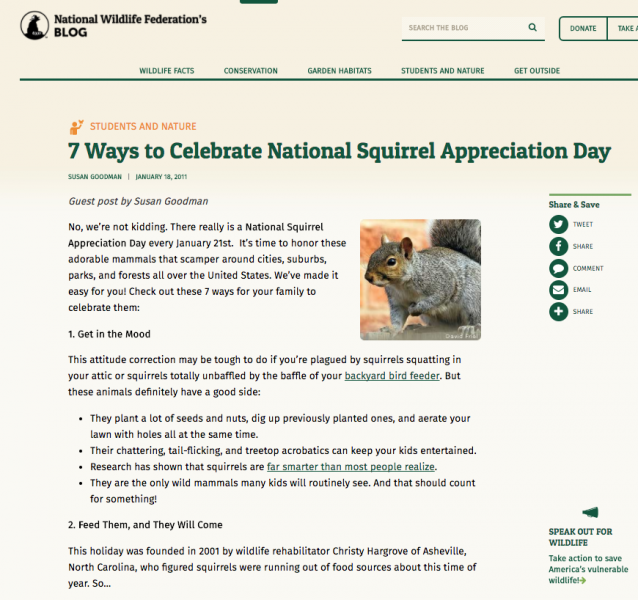 National Squirrel Day: 7 ways to celebrate! Will help to purchase and install our new tree! Will help to purchase signs to showcase the work we're doing in the park. Helps to provide gardening supplies and tshirts for park volunteers who help to keep the park clean. Help us educate our community members to become good stewards of our parkway. Help stop the dumping of trash, tires and other waste into our shared outdoor space.